As an English person living in Australia, I sometimes come across terms which have different meanings here compared to the UK. One such example is ‘high tea’. To me, with my English background, high tea is a fairly substantial meal served at about 5 or 6pm. It might include hefty slices of bread and butter, ham, salad, scones and fruit cake, probably served with mugs of tea from a big, solid tea pot. This fits the definition given by the Macquarie dictionary of ‘a meal eaten in the late afternoon or early evening, typically with a cooked dish, bread and butter, and tea to drink (usually taking the place of dinner).’ There is nothing delicate, to me, about high tea. Afternoon tea in the UK is a much more refined affair, with cucumber sandwiches, small cakes arranged daintily on a tiered cake stand, scones with jam, and specialised blends of tea served in pretty porcelain cups (with saucers, of course!). It is usually taken at about 3pm. In Australia, however, I have found the term ‘high tea’ used to describe what I would refer to as ‘afternoon tea’. Thus an Australian high tea is served mid-afternoon, and is an elegant repast of scones, small sandwiches, little cakes and tea. This has prompted me to do a bit of research on how other countries view high tea. As far as I can see, high tea in Australia, Jamaica, South Africa and the United States is what I would call ‘afternoon tea’ in the UK. I may be wrong about this, though, and would love to see your comments on how this term is used in your country. You can contribute by voting in the poll, and by leaving a comment below. Our bloggers in India and China may have lots to say on this subject! I would certainly understand afternoon tea to be quite a filling meal. Here's a link to the afternoon tea menu served at the Tower Restaurant in Edinburgh. I indulged here last year. Delicious. Mmmh. With the admission of a lower middle class upbringing in the western US, I am only able to comment that high tea or afternoon tea doesn't seem to be in use at all. But either one sounds like an extremely enjoyable way to chase away what my Mom calls 'the afternoon sleepies'. I do not think China has such a high tea thing, at least not I can think of. When consumption of tea has spread to other countries from China, they are pretty creative of it while Chinese still mainly just consume plain green tea. As I understand it, "afternoon tea" is made higher as time passes during the afternoon/evening. So, as you say afternoon tea is a fancy affair at around 3pm, perhaps little cakes and scones and fine sandwiches. As the time stretches to 4pm, you might add small savoury scones and fine ham sandwiches. About 5pm you add pickles and cheeses etc. There is a wonderful description of tea being made "higher" as time progresses (and the characters who have made the tea wait for others to arrive) in a delightful children's book by Elizabeth Goudge called Henrietta's House. In the US, both terms are used interchangeably and no one seems to really know which is which. Whatever it is called, it is almost always afternoon tea-typically tea rooms will call it "high tea" in order to make it sound extra fancy, with all the trimmings. There are many places throughout the US where you can go to experience afternoon tea, from a casual setting to a very formal setting. 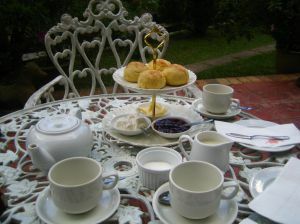 www.teamap.com is a great way to locate tea rooms in the US. Most places serve afternoon tea during lunch hours, while some hotel lobbies offer it at 3pm. There would be hardly anywhere in the US to get a high tea at the proper time-it would be very hard to find. I live in the San Francisco area and have visited every tea room within a 100 mile radius. It's a wonderful way to relax and enjoy some quiet time. I would love to have afternoon tea every day. Afternoon tea is a simple meal, usually between 3 - 4 - cakes scones and so forth. Because people used to eat main meals early - say around 5.30 - 6pm, afternoon tea was a light meal prior to tea - the main meal of the day. High tea is the term used for late afternoon tea - usually around 5pm, introduced to polite society by the Aristo Brits to serve as that light meal before a much later main meal or dinner - the entertainment for the evening, this meal usually starting around 9pm. High tea is cucumber sandwiches and petitfours and so on. And the wonderful introduction of nice teas. Not all the substantial really, but a nice meal before preparing for the main meal of the night. So two different meals, served at different times of the afternoon. In India, You can find tea in several places but there is nothing like Afternoon Tea. We generally take tea in afternoon arround 3-6pm with biscuits, cakes or with some other dishes but it is called as only 'Tea'not Afternoon tea.